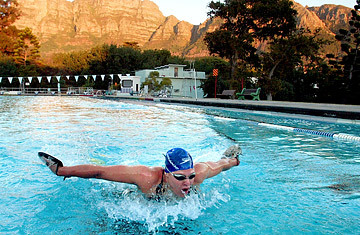 Natalie du Toit made history when she qualified for both the Paralympic and Olympic teams this year. Du Toit is actually the second amputee ever to qualify for the Olympics  George Eyser, an American gymnast, earned six medals in the 1904 Olympics, including three gold, despite sporting a wooden leg. Du Toit will be competing in the 10km swim. She swam for her country from age 14 until February 2001 when, riding home from swimming practice on a motor scooter, she was involved in a car accident. Her left leg was amputated at the knee. She swims without the aid of a prosthetic limb and is unlikely to win a medal. She will certainly win admirers.